PHOENIX — U.S. Rep. Kyrsten Sinema, the Arizona Democrat who has said she was considering running to unseat Sen. Jeff Flake, has officially announced her candidacy. Sinema said in a YouTube video Thursday that she's running for the Senate so she can help people and because she's "not giving up on the American dream." She was elected to Congress in 2012 and became the body's first openly bisexual member. Flake, a conservative Republican who has been a critic of President Donald Trump, was elected in 2012. Sinema will first face off with Democrat Deedra Abboud of Phoenix and businessman and former public school teacher Jim Moss of Globe. "I want to do more for my country. 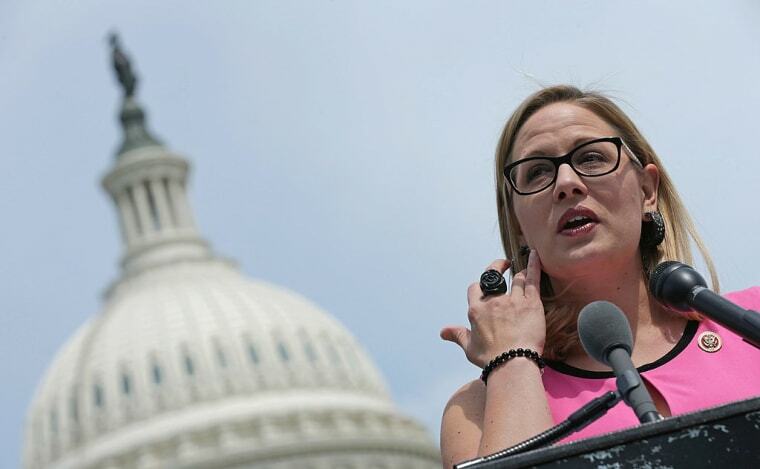 I have the chance to change things and help Arizonans every day," Sinema said in her video. Flake's campaign quickly issued a response to the announcement. "From her time working on Ralph Nader's campaign to the state legislature to Congress, Krysten (Kyrsten) Sinema has always been out-of-touch with Arizona and she'll do anything to hide her progressive record," Jeff Flake campaign spokesman Will Allison said in a statement. But Flake could face a tough primary. Trump has sent out tweets signaling his support for far-right candidate Kelli Ward, a former state senator whom Sen. John McCain handily beat in the last election. If other Republicans join the primary race, it could make it even harder for Flake to win and keep his seat. Sinema has long been considered a top threat on the Democrat side. Sinema, 41, was largely considered a liberal while serving in the Arizona Legislature but has cultivated a reputation as a moderate while in Congress. She recently came under fire by liberal groups for voting in favor of several Trump initiatives, including a bill that gives the government more power to deport immigrants suspected of being in gangs. Aisha Moodie-Mills, CEO of LGBTQ political organization Victory Fund, applauded Sinema's entrance into the Senate race. “Krysten’s announcement presents an enormous opportunity for our community – a chance to defeat an anti-LGBTQ incumbent and replace him with an LGBTQ leader who stands for equality. All of Washington is watching this matchup – including opponents of LGBTQ rights who will mobilize further now that an openly LGBTQ candidate is in the race," Moodie-Mills said in a statement sent to NBC News. "It won’t be easy, but our community will rally and I am confident we can send Kyrsten to join Tammy Baldwin, doubling LGBTQ representation in the U.S. Senate. Representation is power – it changes the conversations and leads to more inclusive legislation and policies. A win for Kyrsten will be a significant victory for our community, and for LGBTQ equality," Moodie-Mills added.